Welcome to Nothing But Brick's new Builder of the Month segment! As the segment's title suggests, Nothing But Brick will be featuring a Lego MOC builder every month. The objective is to recognize and honor the creative and talented people behind the awesome bricks of art we see online. I think these guys and gals deserve it because they create their works out of pure love and passion for the hobby. Hopefully, this will also inspire other members of the local Lego community to follow in their footsteps and come out of their shells and start making their own creations as well. When I started the blog, I've always known that I must write about the awesome people who contribute to the Lego community and I'm really glad that I finally have the opportunity to do so. In a sea of people who are online in social media, there are amazing people out there who would go out of their way to impart their knowledge and talent in good faith to others who are treading the same path of learning to improve one's craft. One of these rare folks is US-based Lego master builder, AC Pin. Amado Canlas Pinlac, widely known as AC Pin in both local and international Lego communities, in my humble opinion, is probably one of the best all-around MOC builders I have ever seen. 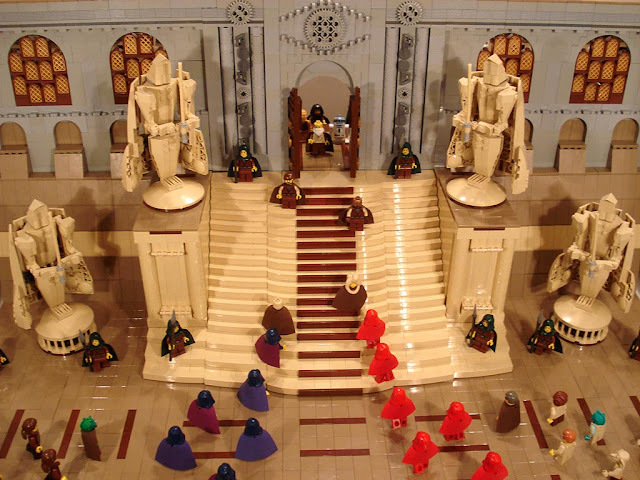 His most iconic work, The Theed Hangar, a massive diorama based on one of the scenes from the movie, Star Wars Episode I The Phantom Menace, has been featured in Lego's Star Wars: The Visual Dictionary. Other than that, his other works have also been featured in brick magazines, blog sites and YouTube channels. He's also active in several brick conventions and exhibits in the U.S.. I've been following his MOCs and I'm really impressed with how versatile his building skills are. The Man can build anything from epic Star Wars dioramas to classic period pieces. What really amazes me is how intricately detailed his MOCs are even if most of those are massive in scale. This just shows how dedicated he is to his craft. Without further ado, here's a peek at AC's remarkable Lego experience. Read on as he shares how he got into the hobby. He also has several insights into MOCcing particularly on how to become better at building and how to gracefully handle criticisms. When I bought a DUPLO set for my oldest son. A very simple DUPLO starter set for my first kid. UCS Super Star Destroyer won in the Eurobricks 2013 Future of SW Contest. How do you manage funding your hobby as a Lego collector/builder? Regular job in IT like everybody else. Where do you get your bricks? Various retail stores, Lego stores and sometimes Bricklink for HTF pieces required for MOCs. Also once a year from the LUG Bulk order. How do you address the hobby’s requirements for storage space? Wait for clearance sales and resist the urge to buy new sets when they come out so no storage space needed. Very seldom that new sets are bought anymore, unless they're needed for a MOC or a good promo/damaged box discount. Multiple sets required for MOCs bought on clearance sales are parted out so the parts go directly to the stock. Sort by color and piece usage specifically for small pieces. Use Ziploc bags for larger pieces and plastic bins for better organization. Sealed sets are stored in large plastic bins and big Balikbayan boxes stored in the cool, dark and well ventilated area. By the time Lego released the Star Wars line and the prequels were shown, the shift on my collection started to move away from action figures to Lego sets. As the Lego collection grew, I was also growing tired of doing action figure dioramas. Then I've started helping/playing with my sons build play areas for their sets. Of course, these are more like simple brick structures that they used to build/play/crash like any kids would do! Over time my sons would sometimes complain that I was taking longer to build the structures as I kept putting more detail into them when they just want to play with them! When a subject matter is picked for a MOC, it all starts by doing as much research as possible to get it right. A lot of reference material/pics are readily available now on the web but before that I'd read about them or watch the movies. Next comes the parts inventory for the required pieces where most of the required parts/pieces are gathered before the build. A prototype/working model is built first with minimal detailing to get the scale/proportions right. Compare with the reference material and research more if necessary. Then build more and so on. If the required pieces are not available or in the correct color, it does not stop the build. These can be easily replaced later on when the parts are available. As long as it needs to get it done, table scrap builds take no more than an hour. In every show that I've been asked the question for a particular large scale MOC like Theed Hangar, Geonosian Arena or Akai Shiro; three months seem to be very long until it's explained that it was the elapsed time to build. It could have easily been a month or less except it's a hobby so I build only when I have free time. The only exception would be for contests where it's usually just a month of build time or less. Only build what you like, so it comes naturally that I've built a lot of SW MOCs since I'm a SW fan/geek. Of course with every new MOC, there's always the need to get the central/iconic/focus part and research on the subject matter helps tremendously before the build starts. Then make use of unusable parts/different designs/build techniques that will enhance the build. If others like what I've built then it's just icing on the cake. If it's a contest entry, winning/placing in the top entries is the best feeling. but you can't win them all and having an entry is a worthwhile experience to have. 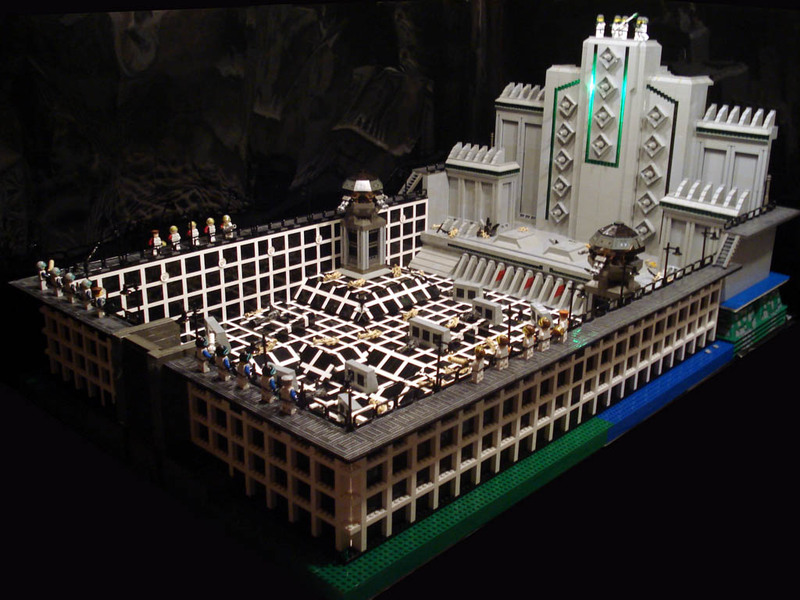 For the community builds/contests, it's planned as I pick out what scenes/MOCs I'd like to create for the theme. Other than that whatever comes to mind that nobody has done yet or even attempted to do. 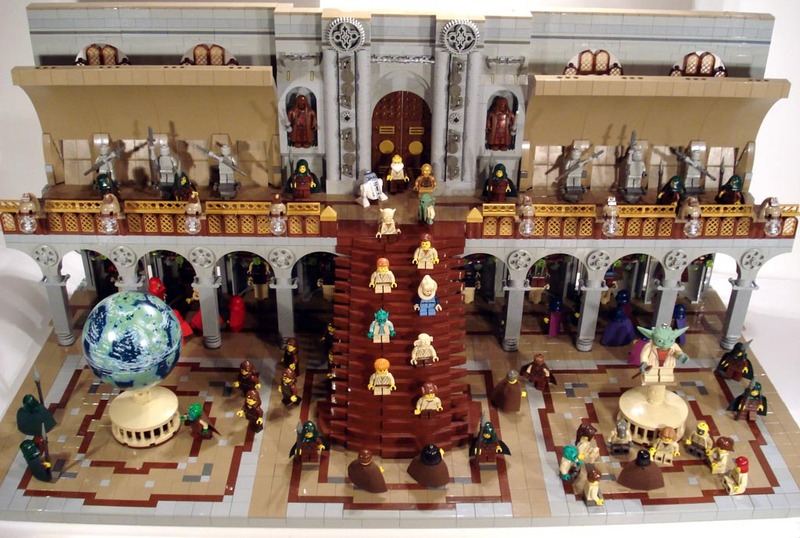 For other themes, the MOCs are more from inspiration like when I knew that the Spartans were going to be released, the thought running through my head was "Wouldn't it be cool to do a 300 MOC?". The Ninjas/Samurais came next which brought out the Red Castle (Akai Shiro). 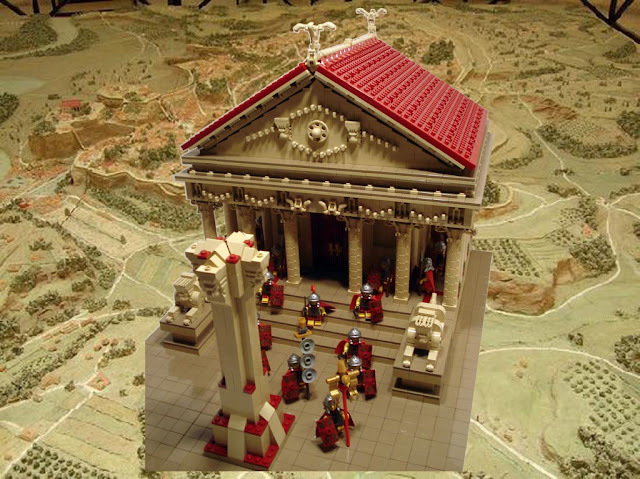 Then came the Romans and a Roman temple was done. There was once a time that my builds were the subject of utter scrutiny from various individuals who were in the same forums that I've been in. Rather than play along with them, I chose not to and ignored their comments. They don't know me as a person, so I couldn't understand why they chose to just judge every MOC that I've done every chance they got. Respect was all I asked and everybody should always give to one another. We can't expect every AFOL to be in the same level/skill/talent of building as others. Next time you see another build/MOC, Respect the builder and their works no matter who they are. There will always be haters no matter how good your works/MOCs are, pay no attention to them and continue to build what you like. Patience is key and being able to maintain focus on the subject/build/process until it's completed. Building system sets helps in learning the basic step-by-step process. Being able to reverse engineer a subject/alternate build/MOC enhances the building experience. Strive in modifying/upgrading sets/MOCs and making them your own. Learn from the MOCs of builders in the themes/genres that you like by studying their creations. The Theed Hangar has been the MOC that everyone recognizes as my signature MOC. It has been featured in the Lego Star Wars Visual Dictionary (May 2014) and the BrickJournal December 2015 #37 issue. It was built back in 2012 and was widely featured in a lot of internet sites/forums during that time. Every time it has been displayed in events/shows/displays it always makes an impression on the attendees. In some events that it wasn't displayed, attendees were asking/looking for it. You can see more of AC Pin's works by visiting the sites listed below. I assure you, you won't be disappointed. Enjoy! There you have it, folks! 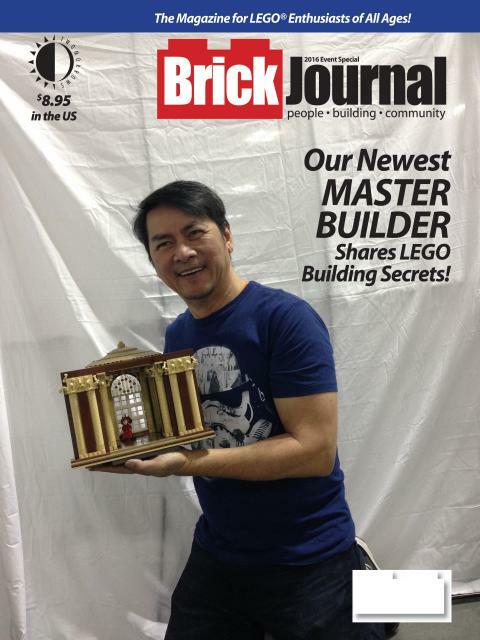 Nothing But Brick's first Builder of the Month feature! It was really an honor for me to be given the opportunity to feature one of the prominent Lego builders of our time in the blog. Come back again next month for another Builder of the Month post. Till next entry! Thanks, Sir AC for trusting Nothing But Brick and especially for taking the time to make this feature happen. Best of luck to your future endeavors, Sir! Can't wait to see your upcoming builds! cool dude...the fact that he got inspired when he was an adult was a surprise!!! I knew Lego longer before he did! lol! Never thought that what started out as a toy for my first son became a hobby that I'd be internationally known for today.